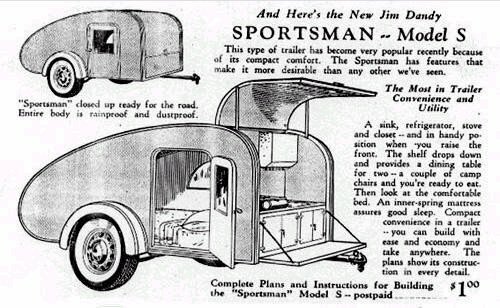 This is a design is the result of a request for a 9.5ft version of the Jim Dandy Sportsman trailer shown in this advert. 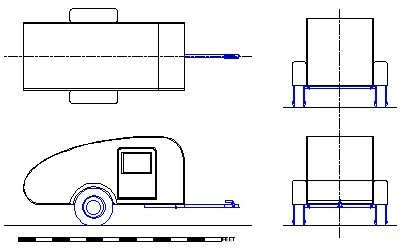 As can be seen, this trailer is 'the other way round' to most teardrops, with the galley at the front and the bed at the back. 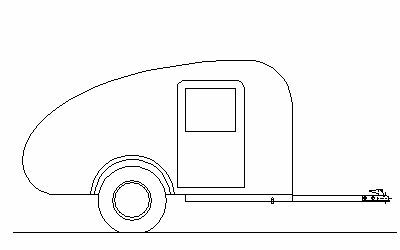 There is some logic to this - full body height at the galley and much less over the foot of the bed - but it is likely that it will be difficult to keep the tongue weight down to a reasonable limit, and can you imagine how many times you would scrape your shins on the drawbar when using the galley? The shin-scraping at least can be reduced by using a removeable tongue as shown in the Mk 2 version below. 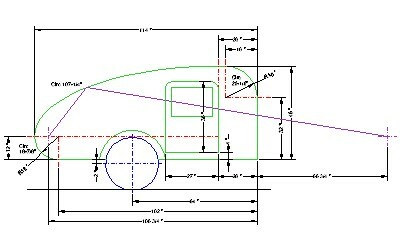 As well as the CAD drawing, the geometry of the profile is also shown.